The American Helicopter Museum and Education Center (AHMEC) unites with the Liberty War Bird Association (LWBA) to educate the public about rotary-wing flight’s importance and to honor Vietnam War Veterans on Saturday, April 13. 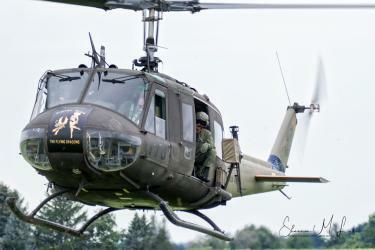 The LWBA, 500 Airport Road, Lititz, offers flights on its newly-restored Vietnam-era UH-1 Huey helicopter beginning at 10:30 a.m. until 3 p.m. as a member benefit for joining the nonprofit’s all-volunteer organization. “Our motto is Educate, Honor, Restore,” explained Charles Bechtel of the LWBA. “Our intent is to let the public see the helicopter in an effort to educate them as to how important it was to the Vietnam War. We are primarily Vietnam Veterans honoring our fellow Veterans with this helicopter, and our senior pilots are retired Army helicopter pilots who have thousands of hours flying all types of helicopters. (We) purchase, restore and fly Huey helicopters because of the impact the helicopter had during the 20-year war in Vietnam. We have this helicopter flying after 15,000 man hours with 20-some people working every Saturday. We just got it out of the paint shop. It will look exactly as it did during the war. The Vietnam War became known as “The Helicopter War” largely due to the Huey. Bell Helicopter’s iconic aircraft was the first turbine-powered helicopter contracted by the military, and proved to have the necessary horsepower to change the Army’s capabilities. It was quick, sturdy and multifunctional. It moved troops, carried supplies, provided air support and evacuated wounded soldiers, saving lives that might otherwise have been lost. Foremost is becoming a member of LWBA to support its important mission for a cost of $80.00 per person. Amenities include a membership card, quarterly newsletter, schedule of events, LWBA pin and a flight in Huey 823, which holds seven people. Flights in Huey 823 are on a first come, first served basis and last six to seven minutes. Daily admission rates, found on AHMEC’s website at www.americanhelicopter.museum, apply for entrance to the museum. Museum helicopter ride gift certificates are not valid. Call 610-436-9600 for more information.